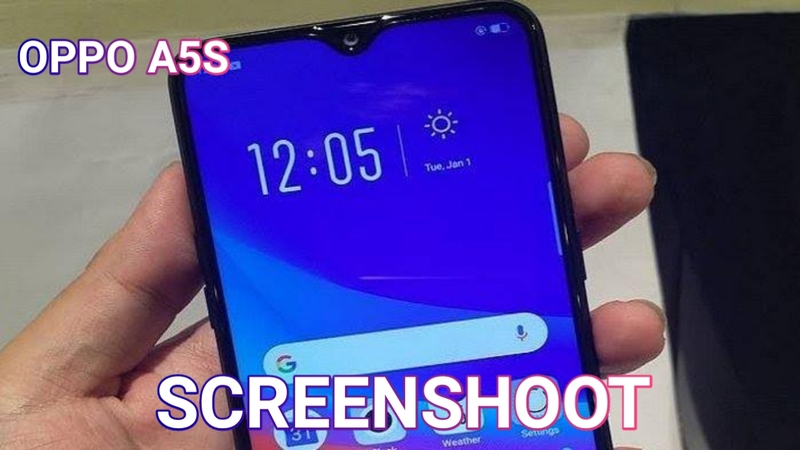 How to Take Screenshot Oppo A5S - On March 27 yesterday Oppo A5S can be purchased offline or online. Which is the latest opposition phone in bandrol at a very affordable price, but comes with complete features and luxurious appearance. The Oppo A5s comes with a 6.2-inch screen with an IPS panel that supports a resolution of 720 x 1520 pixels. This screen has an aspect ratio of 19: 9 and is protected by Gorilla Glass technology from Corning. The Oppo A5s mobile phone is equipped with a waterdrop bangs model that is available with a 8 megapixel resolution selfie. This selfie camera is equipped with AI Beautification 2.0 technology. At the rear, the Oppo A5s emblazoned two camera sensors, each of which has a resolution of 13 megapixels and 2 megapixels (depth sensor). The Mediatek Helio P35 chipset was rejected on the Oppo A5S which has a clock speed of up to 2.3 GHz. The chipset is combined with 2GB RAM and 32 GB internal memory. Android 8.1 Oreo is coated with the ColorOS 5.2 interface which is the software for Oppo A5S. The battery itself has a large capacity, 4,230 mAh which will boost all the activities of this cellphone. Well, on this occasion we will give a tutorial on how to use screens or screenshots on Oppo A5S phones. Which is not many people know because this phone is still new. This 3-finger option becomes a smartphone made by Oppo, because all the devices already use this feature. Directly following is the following. Open the Settings or Settings menu. Select the Smart & Convenient menu, then select Movement. Then select Gestures then activate the 3 finger screen capture feature. To request what you need to try by sliding your 3 fingers from top to bottom or from left to right. This one feature is indeed all Android devices, including the Oppo A5s which this feature is also available. How do you apply it? Let's use it below. This method is fairly easy, but you have to install the Screenshoot application which can be downloaded via Google Play. Many applications can be selected, and how to use them varies. But use this method safer and simpler. Hopefully useful, for other interesting articles you can read below.